A big change has happened here this week – from today you will be able to order duplicate birth, marriage and death certificates from Essex from the ERO. We have already put the new system to good use; our very first customer needed a copy of her daughter’s birth certificate to be able to fly to South Africa today. After a 9am phone call from her we checked that we had the relevant register, ordered it up and prepared the certificate and she collected it from us, all in less than 30 minutes! She was extremely pleased to get this vital document for her holiday as the rest of her family were already at Heathrow Airport. Copies of historical birth, marriages and death certificates cost £10. They will be produced and posted within five working days. If you require a certificate more quickly, you can get one the next working day for £25, or within 2 working days for £18. These prices do not include postage and packing. 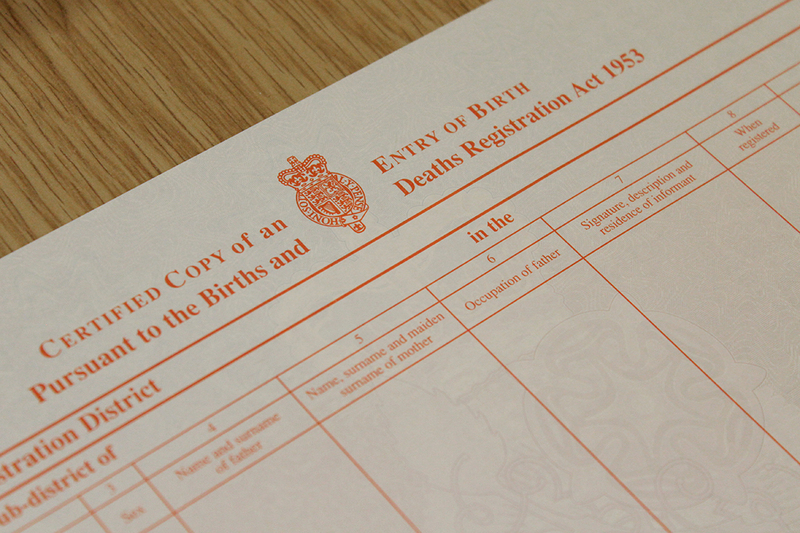 Please note: We do not hold the Registration Service birth, marriage and death registers for the parts of the historical county of Essex now administered by Southend-on-Sea Borough Council, Thurrock Council and the London Boroughs of Havering, Barking and Dagenham, Waltham Forest, Newham and Redbridge. Whenever we give talks to people about parish records and their use in family history research, we make the point that some burial registers can give extra information about the deceased in addition to the bare details of name, date and age, and sometimes record background historical information. A case in point is the burial register for Hatfield Broad Oak, 1813-1859 (D/P 4/1/26), which was deposited with us in November 2011. Most of the register confines itself to recording the bare minimum details of name, abode, when buried, age and by whom the ceremony was performed, as stipulated under the terms of ‘Rose’s Act’ of 1812, which stated that “amending the Manner and Form of keeping and of preserving Registers of Baptisms, Marriages, and Burials of His Majesty’s Subjects in the several Parishes and Places in England, will greatly facilitate the Proof of Pedigrees of Persons claiming to be entitled to Real or Personal Estates, and otherwise of great public Benefit and Advantage”. Nevertheless, even though the information is basic, we can still build up a picture of the demography of death in Hatfield Broad Oak which tells us something about what life might have been like then. 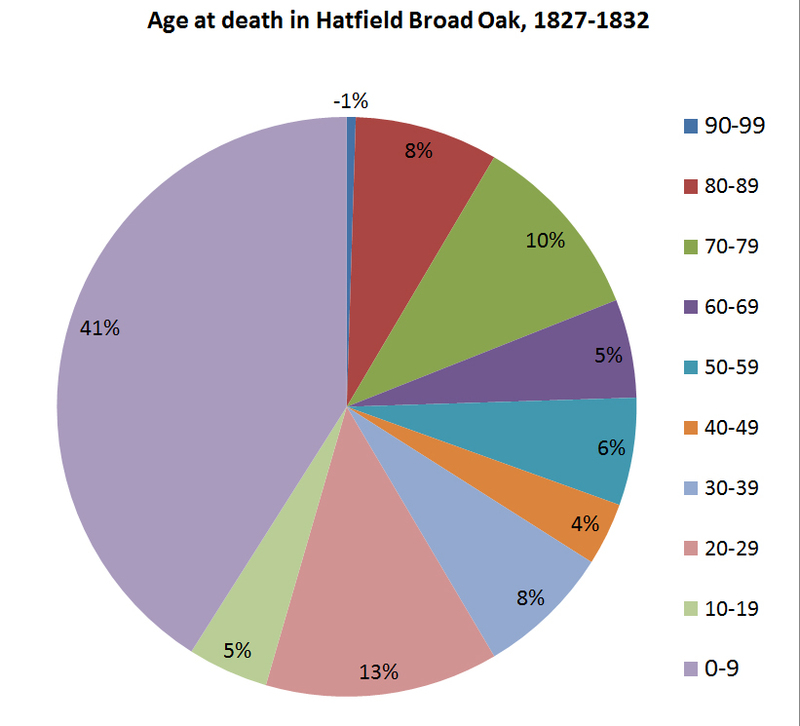 Pie chart showing age at death in Hatfield Broad Oak, 1827-1832, taken from the parish register. A total of 200 deaths are recorded during this period, and over 80 of them were children under 10 years old. For example, looking at the ages of those buried (above), one forgets just how high the infant mortality rate used to be before improvements were brought about by modern hygiene and medical practice, and how likely it was having survived birth you might not have survived much beyond early childhood. 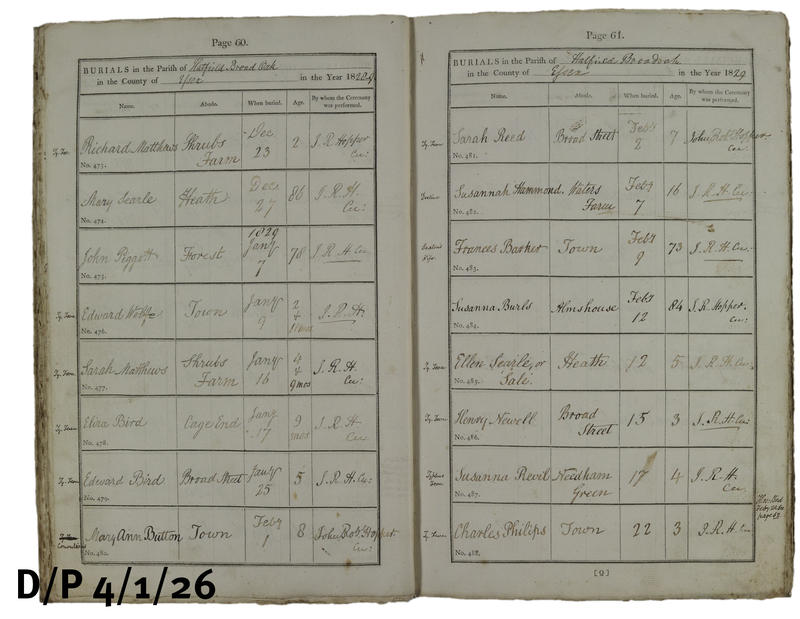 The register shows that, out of the 200 or so burials which took place between 1827 and 1832 in Hatfield Broad Oak, 80 of them (40%) were of children aged 10 or under. At the other end of the scale, it shows also that only 20% of those buried reached what we would now consider as old age, i.e. over 60. A lot depended upon the individual incumbent as to whether he was disposed to record additional information. 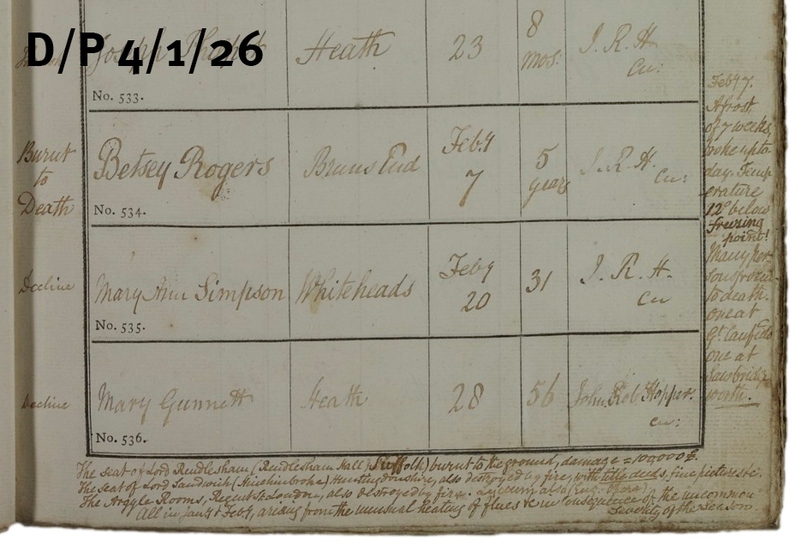 From May 1827, the new curate at Hatfield Broad Oak, John Robert Hopper, took it upon himself to start recording in the margin the cause of death of those he was burying and other information besides. So, we find that a serious epidemic of typhoid carried off 25 children between September 1828 and June 1829, reaching a peak in January and February 1829 (below). In 1830, it was measles that took 6 children in March and April and in 1831, 4 children died of whooping cough. Throughout the period, 4 infants died of convulsions. Typhoid, an indicator of impoverished and unhygienic living conditions, seems to have been a major cause of death during the period, with 37 cases, followed by a condition described rather vaguely as ‘decline’ which accounted for 23 deaths. A few died of consumption or of ‘inflammation of the bowels’ or of dropsy. One 52 year old died of cancer in 1832. Two were simply found dead in their beds and one woman aged 27 was found dead in a field on Sunday 30th March 1831 – the verdict that she died of apoplexy. Occasionally, a fatal accident is recorded as the cause of death. In November 1828, a 64 year old Edward Bird ‘fell thro’ 2 floors of Mr P Sullivan’s malting, Heath and died a day or 2 after’. Another died in July 1832 of ‘old age arrested by a fall down stairs’. In May 1830, one Patterson Parker ‘accidentally shot himself’. Later that same year in July, a Royal Naval Lieutenant, George Berkley Love, visiting from Yarmouth on the Isle of Wight, was working in the Park of Barrington Hall when he ‘accidentally cut himself thro’ the lower third of the thigh with a scythe’ and bled to death in 5 minutes. J. R. Hopper records that an oak tree was planted soon afterwards to mark the spot where the accident occurred. Feb.y 7. A frost of 7 weeks broke up today. Temperature 12° below freezing point! Many persons frozen to death. One at Gt Canfield, one at Sawbridgeworth. The seat of Lord Rendlesham (Rendlesham Hall, Suffolk) burnt to the ground, damage = 100,000£; The seat of Lord Sandwich (Hinchinbroke, Huntingdonshire) also destroyed by fire with title deeds, fine pictures, etc. ; The Argyle Rooms, Regent St, London also destroyed by fire. Lyceam also…All in Jan.y in Feb.y arising from the unusual heating of flues etc. in consequence of the uncommon severity of the season. If you would like to find out more about parish registers and how they can help you with your research, come along to our next Discover: Parish Registers workshop on Thursday 12 March 2015, 2.30pm-4.30pm. Tickets are £10.00, please book in advance on 033301 32500. Full details can be found on our events page. After the purchase of Benjamin Chipperton’s will (Acc. A14021 Box 1) written on the 28th August 1795, I have been able to draw up a family tree and look into a small part of village and family life in the late 18th and early 19th century. As mentioned below this document could be one of a number of documents that have been split up and I have been unable to pinpoint the exactly location of the messuages and cottages owned and mentioned in the will. Benjamin Chipperton junior was baptised on the 4th March 1738, the son of Benjamin Chipperton senior and his wife Elizabeth. Benjamin junior’s first wife was Susan Winter; together they had two sons, another Benjamin, and then James. Susan died a year after James’s birth. 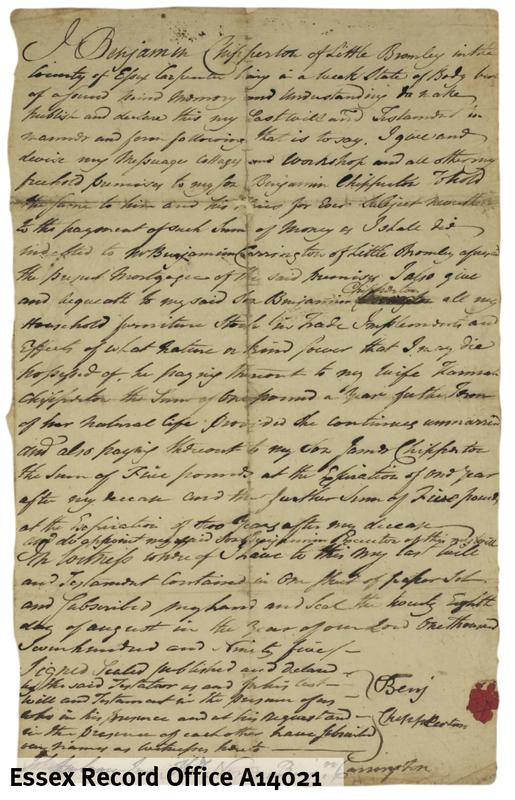 Benjamin junior remarried on 17 November 1774 to Hannah Cook of Little Bentley. Benjamin junior’s will highlights his career as a carpenter, as the main items mentioned are his workshop and tools. It also makes clear his hope or expectation that his son Benjamin III would take over the business; he was left the family home, household goods, workshop and tools. The will mentions only modest amounts of money: Benjamin junior left £1 to his wife for every year she lived but remained unmarried, and £5 to his second son James on the year of his death and the year after. The old money converter from the National Archives suggests that in the 1790s £1 was 6 days of a craftsman wages, and £5 was 33 days. However, all was not to work out just as Benjamin junior might have planned. From the Little Bromley parish registers (viewable on Essex Ancestors) we learn that three generations of Chipperton men all died within five years: Benjamin Senior was buried on 23 September 1795, Benjamin junior died in 1798, and his son Benjamin III was buried on 15 June 1800. If you have managed to keep up with all the Benjamins through to the end of this post then well done – and just as a bonus one of the witnesses to the will was also a Benjamin, although at least with a different last name (Carrington).